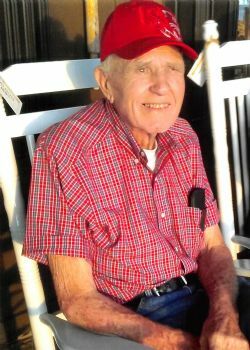 A native of Silas, AL and resident of Semmes, AL died on Wednesday, December 19, 2018 at the age of 84. Mr. Phillips retired from Delchamps after 34 years of service then had his second retirement from Greer’s. He was preceded in death by his parents and seven siblings. He is survived by his wife, Naomi O’Brien Phillips; children, Janice (Dan) Etheridge, Richard (Cyndi) Phillips and Beverly K. (Richard) Vajgrt; grandchildren, Christopher (Kallie) Etheridge, Candace (John) Cannon, Rick (Jennifer) Etheridge, Keysha (Ashton) Lamey, James (Sonia) Etheridge, Michelle (Ryan) Stringfellow and Jessie (Davis) Simms; fifteen great grandchildren and his sidekick Buddy. Funeral services are scheduled for Friday, December 21, 2018 at 12:00 Noon from the Chapel of Mobile Memorial Gardens Funeral Home with visitation beginning at 10:00 AM. Interment will be in Mobile Memorial Gardens. A chapel service will be held at 12pm on Friday, 12/21/2018 from Mobile Memorial Gardens Funeral Home, followed by a committal service at the grave site.